The best place in the Baltics to be merry! 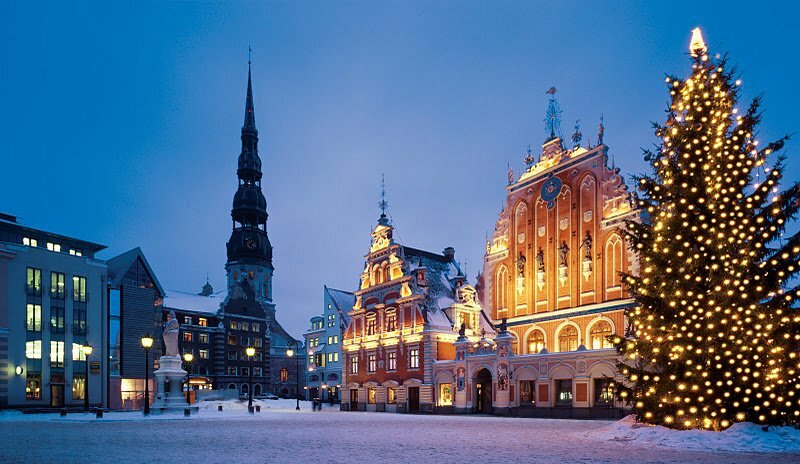 Riga is perhaps the best place in the Baltic region for enjoying the Christmas and New Year holiday season. You needn’t go as far north as Santa Claus’s home inside the Arctic Circle to feel the spirit and warmth of Christmas as you’ll find it right here in the Latvian capital, where Santa is spending the festive season this year. Yes, it’s true! We’ve seen him! And we guarantee you can see him too, here and there, if you come to Riga. Legend has it (there’s no photographic evidence) that this is the city where the Christmas tree was decorated for the very first time, 500 years ago. This year marks the 501st anniversary of that first Christmas tree, and Riga is offering unforgettable fairs and events in the streets of Old Town as well as festive performances in the churches and concert halls. All of the events are too numerous to mention, but here are a few of them. For more detailed info in English and other languages, visit the LIVE RIGA website liveriga.com. There’s plenty to enjoy at Riga’s Christmas markets. Spiced wine, roasted almonds, bacon buns, hot tea, coffee and gingerbread – and that’s just the stuff you put in your mouths. Just follow the aroma, and you’ll be led to the city’s key Christmas fairs, which also boast merry-go-rounds, songs and stalls selling handcrafted jewellery, ornaments, woodwork, ceramics, and knitted hats and socks. Three Christmas fairs can be found, at Dome Square, Līvu Square and Esplanāde Park, running from November 26 to January 8, every day from 10am to 8pm. Use a map to guide you to see 25 trees – traditional and avant-garde – mostly designed by students from the Latvian Academy of Art. Visit the Tourism Information Center on Rātslaukums for more info. This festival offers classical, contemporary and jazz music throughout December in the city’s churches and concert halls. Popular Christmas melodies, twice during the day. These concerts feature outstanding musicians, beautiful music, popular songs, classical masterpieces and premieres of new compositions. These concerts at the Latvian National Opera are promised to sparkle like champagne. Expect enchanting melodies and stars such as the lauded mezzo-soprano Jeniece Golbourne and bass-baritone Donovan Singletary from the US, the brilliant Latvian bass-baritone Egils Siliņš and other young soloists. Other LNO productions this month include the warming “A Midsummer Night’s Dream” (21st), “La Traviata” (22nd) and the ballet “The Sleeping Beauty” (23rd). Check the calendar at opera.lv. A “fiery” concert program and “the new sensation of the music world”, an 18-year-old conductor from Venezuela, are on the bill for three evenings. The Ukrainian circus star and festival winner Vladislav Guncharov and his ten lions are making a stop in Riga on their way from Moscow to the International Monte Carlo Circus Festival. Two of the lions are completely white, apparently. A special seasonal musical and theatrical treat from the Riga Circus tells the story of a Christmas tree celebrating its birthday at the circus. The performance features lions and other exotic beasts, acrobats and clowns and, of course, Santa Claus, the Snow Maiden, singing angels, and dancing snowflakes. New Year’s fireworks display, concerts and events at the Freedom Monument, broadcast live on TV. If you still haven’t decided what to do in Riga, take a look at the Riga Tourism Development Bureau’s new interactive booklet “What to Do in Riga?” (October-December issue), liveriga.com, under Info Materials. There you’ll find information about the key events in the city, events for children, exhibitions, sports events, cafés, art galleries and more.